Well, I got up this morning and took a look on Amazon, as I usually will every few months, and went through my list of favourite authors to see if she/he has anything new coming out. John Steakley is one of them, and this morning I thought “I’ll go to Wikipedia” with the intention of seeing if the man has a website I could visit. Only to find that the man is no longer with us. Well, I was a little shocked. John only wrote two novels and a handful of short stories. I never read his short work, but his novels, which contain the same character names of Jack Crow and Felix (different characters and genre to boot), were some of the fastest, most gripping action reads I’ve ever come across. Armor tells the tale of a guy called Felix, who seems to have something of a death wish. He’s off to a hostile planet overrun by huge ant-like aliens that are pretty much out to kill any human that sets foot on their rock. Felix is a scout (with odds on his head as to how long he will survive) for a battalion of heavy high-tech, power-armored space soldiers (a nod to Starship Troopers) that gets dropped to the plant’s surface, and immediately gets chewed up by the aliens’ one devastating weapon: mass attack. Felix survives and keeps on surviving… and I’ll stop right there. There is a sub-plot in the middle of the book, which deals with Jack Crow, interstellar space pirate thinking on robbing a planet of its goodies–the exact details escape me right now (I’ll have to read it again now just in honor of John) but the separate threads link up just wonderfully at the end. I was looking at some of the reviews on Amazon, and it looks like out of 299 reviews, 199 of them were 5 stars. I personally think the book reads like a rocket. I’d give it 5 stars as well. John’s other book is just as grim as his story of powered armor and the men inside of the suits. Vampire$ has two things in common with Armor: the two main characters share the same names in both books, and the fast-paced action. Vampire$ is about Jack Crow and his Vatican-sanctioned and supported team of Vampire hunters. These are the guys that volunteer to go into a town, and by God, rip out evil by its balls. They’re fighting evil, goddammit, honest to god evil, and go anywhere when they are called. I think of this as a much darker version of Ghost Busters. On Amazon, out of 107 reviews, 64 are 5 stars. I really enjoyed this book, but because of a mid-story that really goes on way too long, I’d give it only 4 stars. Steakley can write action. He writes fast action, and anyone who is thinking about how to write fast action would do well to make a study of how he does it. Or… did it. Forget about the movie–I personally think that hollywood suits somehow worked their black magic behind the scenes and screwed it up for John Carpenter and John Steakley. Anyway, a quick post today, just to let you know about Steakley’s end (by an undisclosed illness). 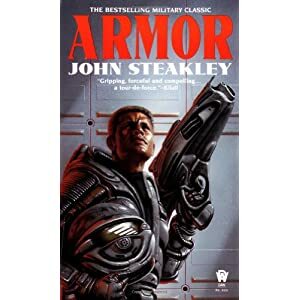 He was working on a sequel to Armor, called Armor 2, and you can see an excerpt from the story here : http://johnsteakley.com/Armor2.html which is a fan site. The date says 2004, so…. who knows if this was ever finished or not. Who knows, if he was writing a sequel to that, he might have been thinking of a new Vampire$ tale as well. There was mention of a unknown book called Gabriel, but I don’t know anything more than that. It could have been about anything (I’m guessing from the name, it might have been about an angel? Maybe?) but it probably would have been another motor of a story. I hope that they make Armor into a movie before I die….but not like Vampires…it sucked but that was not Steakley’s fault. I’d really like someone to carry on with Armor 2… if the Steakley estate would permit it.